Despite the fact Kenny G may have tainted any associations that might come to mind when you think Seattle and jazz, anyone who knows (even slightly) better knows that Seattle is a great place to hear jazz from near and far. While we’re far from able to have anything that resembles an intelligent conversation about the nuances of jazz beyond the little we retain from our Intro to Jazz classes we took in college, we can say with certainty that Seattle (and the Seattle area) is home to some first rate jazz musicians. 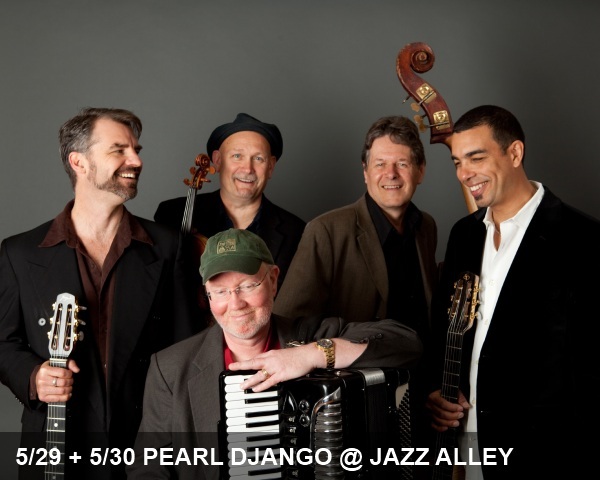 While Bill Frisell reigns supreme at the top of our city’s jazz hierarchy, gypsy jazz quintet Pearl Django certainly ranks up there as well. The band, which started out as a Tacoma-based trio in 1994, is consistently regarded among the best purveyors of modern “hot” jazz with distinct Parisian and gypsy flourishes. Pearl Django will be back at Dimitriou’s Jazz Alley tonight for the second and final night of their release shows for Eleven, their aptly titled 11th album.